What is the difference between ClearKone and UltraHealth? ClearKone and UltraHealth are similar in that they are both hybrid lenses that use the vault system for fitting. That is where the similarity ends. The two lenses have different materials, different GP designs and a different soft skirt design. UltraHealth is made with a GP material that provide 130 Dk of oxygen permeability compared to a 100 Dk of oxygen permeability of ClearKone. UltraHealth also includes both a UVA and UVB blocker, an important component for eye health especially in patients with irregular cornea conditions. An even bigger increase in oxygen permeability comes with the new silicone hydrogel skirt of UltraHealth. The UltraHealth Dk is 84 for UltraHealth compared to 9.3 for ClearKone. What is the difference in design between ClearKone and UltraHealth? UltraHealth and ClearKone have two significant design differences. 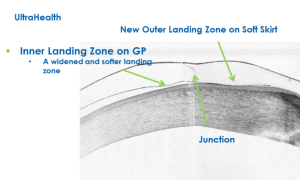 In UltraHealth, the inner landing zone, where the GP rests gently on the cornea, is smoother and wider than with ClearKone. 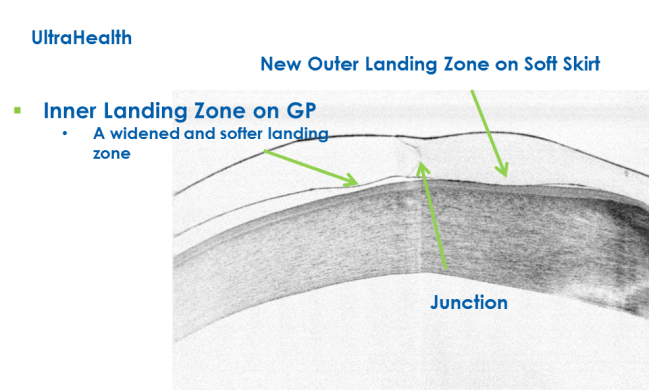 Secondly, UltraHealth has a new outer landing zone on the soft skirt which gently supports the entire lens system, keeping it aligned, supported and comfortable. These two design changes work together to improve both tear circulation and comfort. How does a hema skirt behave differently in a hybrid than a SiHy skirt? SiHy has a higher Dk than Hema. In the case of UltraHealth or Duette, the SiHy skirt has a Dk of 84 compared to previous hema designs which had a Dk of 9. In the UltraHealth design the purpose of the SiHy skirt is to provide GP centration and edge lens comfort, not lift. This is important, because the SiHy skirt does not have the strength to permanently lift the GP off the cornea. While initially the SiHy may provide a temporary lift, after lens wear, the SiHy skirt does not hold up the lens and the lens settles down. That is why it is very important to fit the vault of the lens first, making sure that the vault clears the apex. Once this happens, then the skirt can be evaluated for optimum fit. Steeper skirts tend to be used in smaller, rounder eyes.